Trying to find something interesting to listen to on the commute to work or school? Look no further than the podcasts at Fountain Pen Geeks! Eric & Dan's weekly podcasts are an informative and entertaining way to learn about new pens and pen-related products... and it's completely free. You can listen to their podcasts directly from the site, or you can download the podcasts from iTunes and listen to them on the bus or in your car. 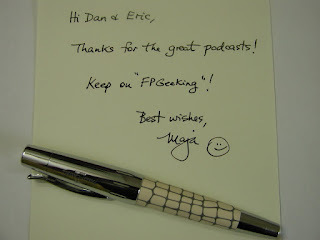 A special shout-out to the guys for featuring my "Geek Note" pen photo on the Show Notes for podcast # 11 here. In my note, I neglected to mention that the pen used was my awesome Faber-Castell E-Motion Ivory "Crocodile" (Precious Resin) fountain pen that I bought from Kim at PenQuest.com (filled with Noodler’s # 41 Brown ink purchased from the Perks pen store on Cambie St. where our club meets). I am looking forward to more interesting content in future podcasts, as well as great pen reviews & pen-related news on their website. Kudos to Dan & Eric on a job well done!